Most of us have students that have mastered basic reading strategies, but struggle with decoding multisyllabic words. In order to increase reading fluency and comprehension, students need to be equipped with the decoding skills necessary for reading harder and longer words. If students are able to identify the different parts of a word including the root, prefix, and/or suffix, word recognition will improve, leading to an overall increase in reading comprehension. 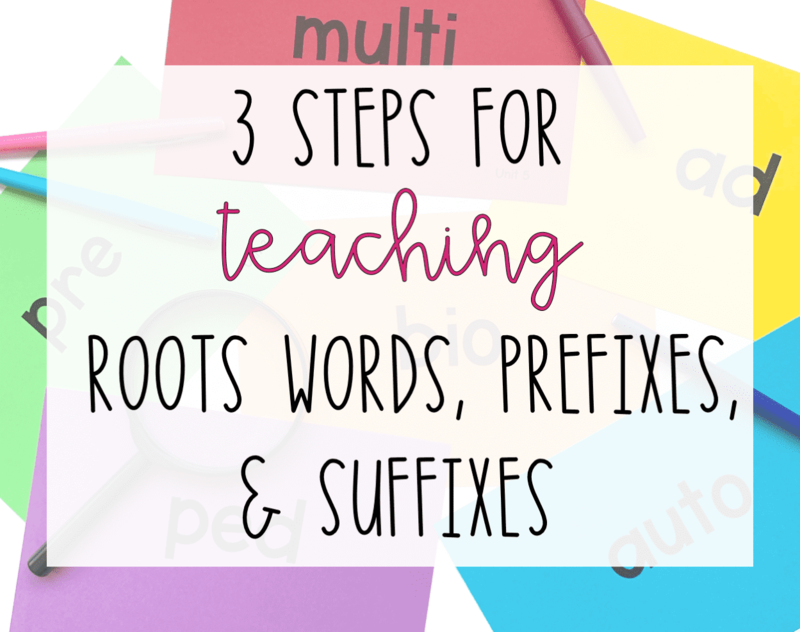 The strategy outlined in this post highlights each step of the process for teaching students 60 high frequency Greek and Latin roots, prefixes, and suffixes. The first step is to explain the different parts and functions of words. It is important that students understand that most longer words have a root, prefix(es), and/or suffix(es). Spending time dissecting words together as a class will typically get this point across. Taking longer words apart and putting them back together like puzzle pieces serves as a great visual. This part of the process is only to introduce students to the concept of word parts. After students have learned the basic parts of longer multisyllabic words, they are prepared to start learning the high frequency Greek and Latin roots, prefixes, and suffixes. The number of word parts you cover with your students will depend on the amount of time you can devote to this purpose. I have found that introducing two or three new words parts each week seems to be a comfortable number. The Greek and Latin roots, prefixes, and suffixes that you introduce will build on each other, so it can get overwhelming if too many are introduced at once. Start by choosing sixty different high frequency word parts that you wish to cover throughout the school year. 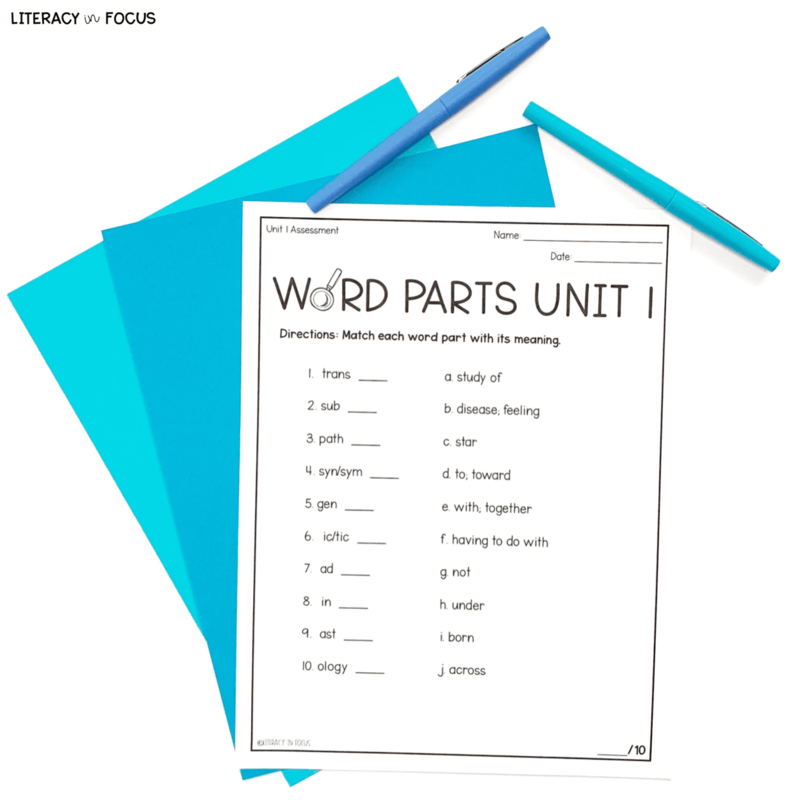 Once you have chosen the word parts you will focus on, break them up into six different units. Each unit will have ten word parts, making it easier for you to teach and less cumbersome for your students to learn. 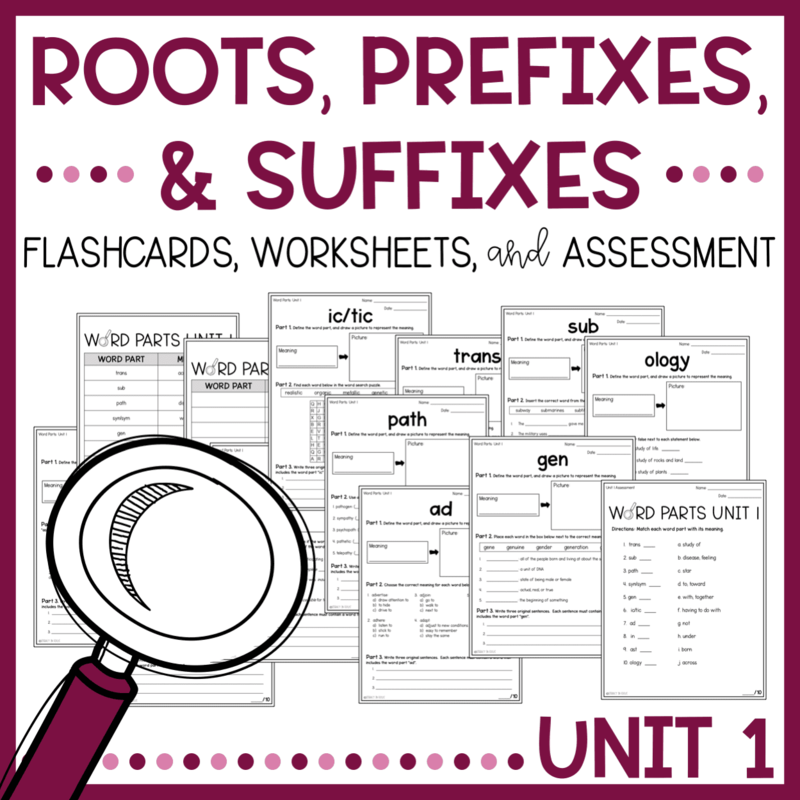 Click here to download Root Words, Prefixes, and Suffixes Unit 1 for FREE! Start each unit of study by passing out a blank master list. As the unit progresses, students will record each new word part on their master list. I like to use large print flashcards to introduce the new word parts. The flashcards work well because they allow for continued practice of all the word parts as the unit progresses. As the word parts build throughout the unit, it’s fun to use the flashcards to play different games. Around the World is a fun game that incorporates the flash cards and works really well for reviewing the word parts students have learned. Having all 60 word parts on pre-printed large format flashcards will also give you the opportunity to take advantage of any extra time you might have in the classroom. It’s nice to be able to pull out the flashcards and have an impromptu review session at a moments notice. After introducing each new word part, provide students with an opportunity for independent practice. 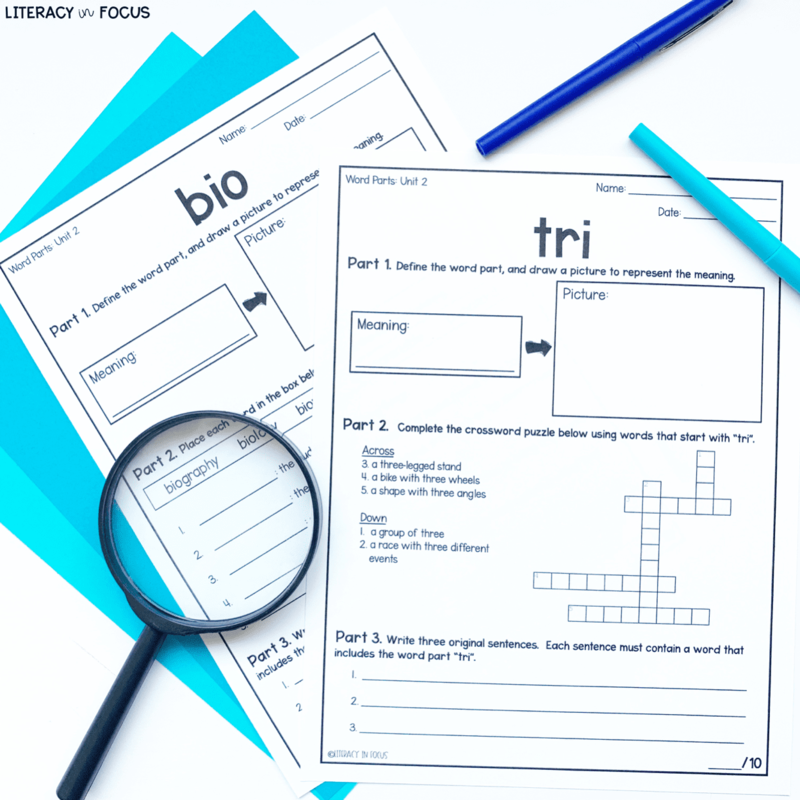 A worksheet dedicated to each unique word part will give students a chance to practice and apply what they have learned. The worksheet I use requires students to work with an individual word part in multiple ways. First, students define the word part, which has already been done using the flashcards, and draw a picture to represent the word part’s meaning. Next, students complete an activity that requires them to identify a multisyllabic word that contains the specific word part they are studying. Finally, students write three original sentences using longer words that contain the word part. Ideally, working with the word part in three different ways will help to solidify meaning. Depending on time, students can complete the practice page as classwork or homework, making sure each worksheet is completed before the next word part is introduced. A formative assessment is used to monitor student progress as each unit progresses. The unit quizzes will show areas of weakness and highlight those word parts that might be giving students trouble. A simple multiple choice quiz for each unit is a quick way to assess students, and it will provide you with valuable feedback. After working through all six units, students are tested on all the word parts with a comprehensive exam. 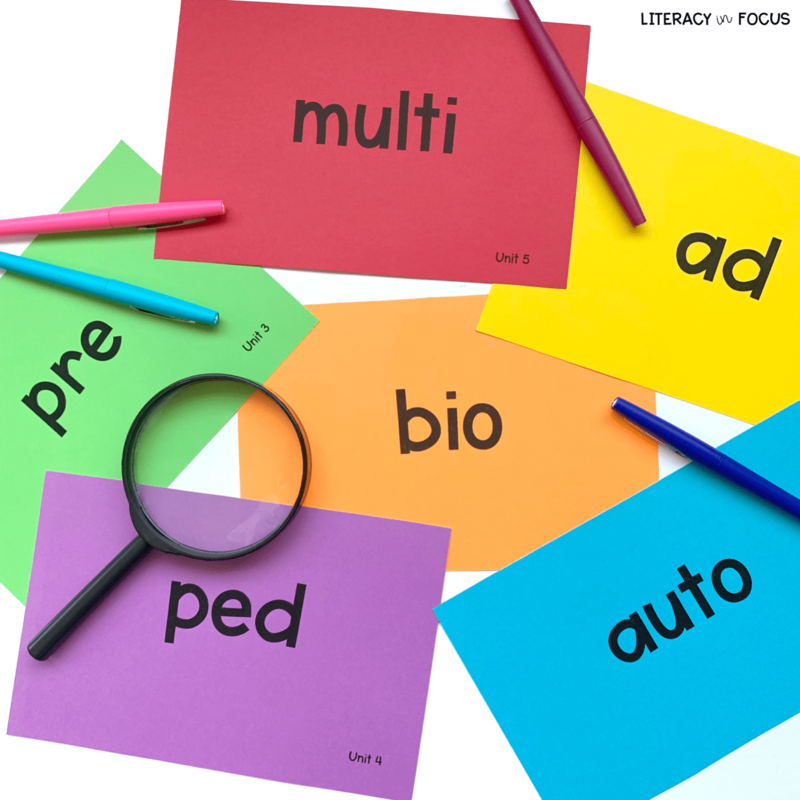 Teaching sixty different Greek and Latin roots, prefixes, and suffixes over the course of the school year will give students a chance to build a strong foundation over time. As students are increasingly exposed to high frequency word parts, reading comprehension and fluency will improve. 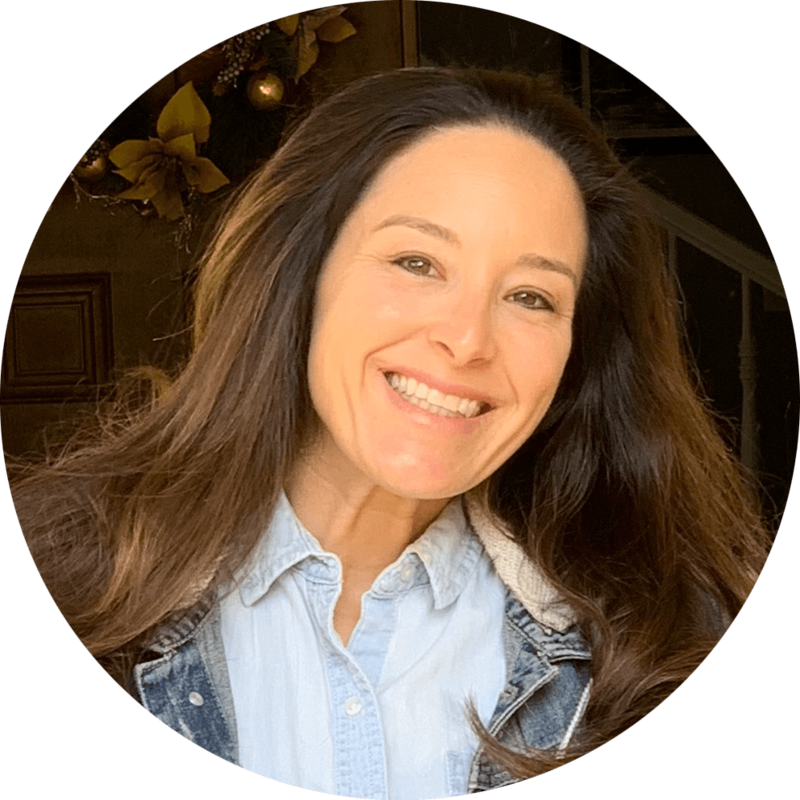 In addition to an improvement in fluency and comprehension, students are encouraged to be curious word learners, and, by imagining vocabulary words as puzzles to be solved rather than pieces of information to be digested, they become much more engaged. Overall, the ability to decode unfamiliar words plays a big role in becoming a strong independent reader, especially as exposure to content specific information increases over time. 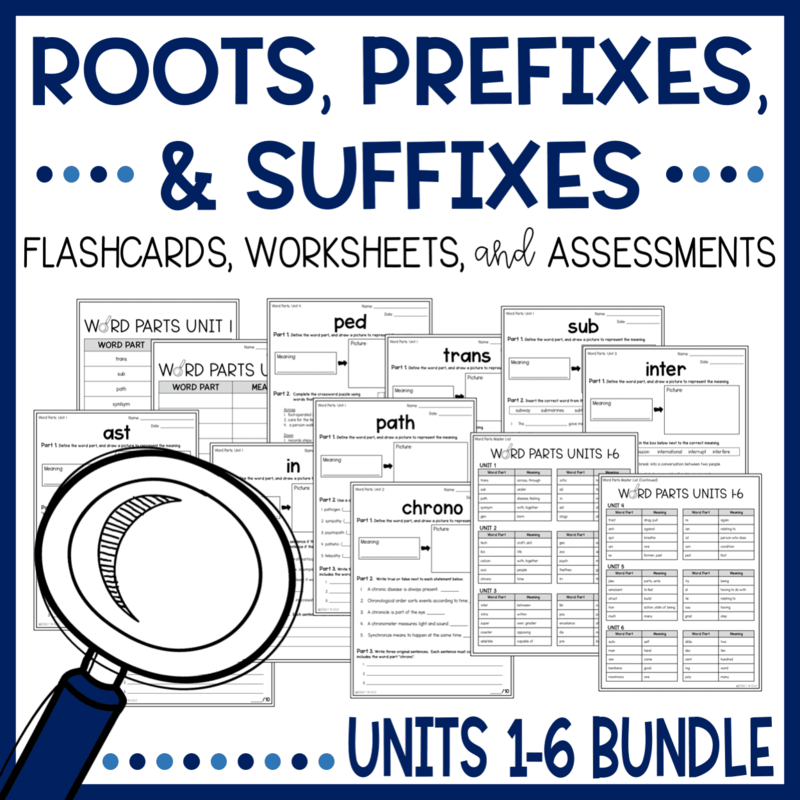 Click here to download EVERYTHING you need to teach Greek and Latin roots, prefixes, and suffixes for the entire year!